One of my favorite flies for bass and bream is Turck's Tarantula. The Tarantula was designed as a trout fly and won the Jackson Hole One-Fly contest a few years back, but I like it for bass and bream. The Stealth Bomber is a foam diver/slider designed to duplicate the diving motion and the resulting bubble trail made when the Tarantula is given a hard strip (drives `em crazy). 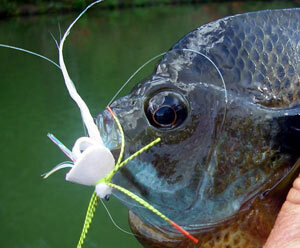 The Stealth has become my "go-to" topwater for all the black bass species and big bream. 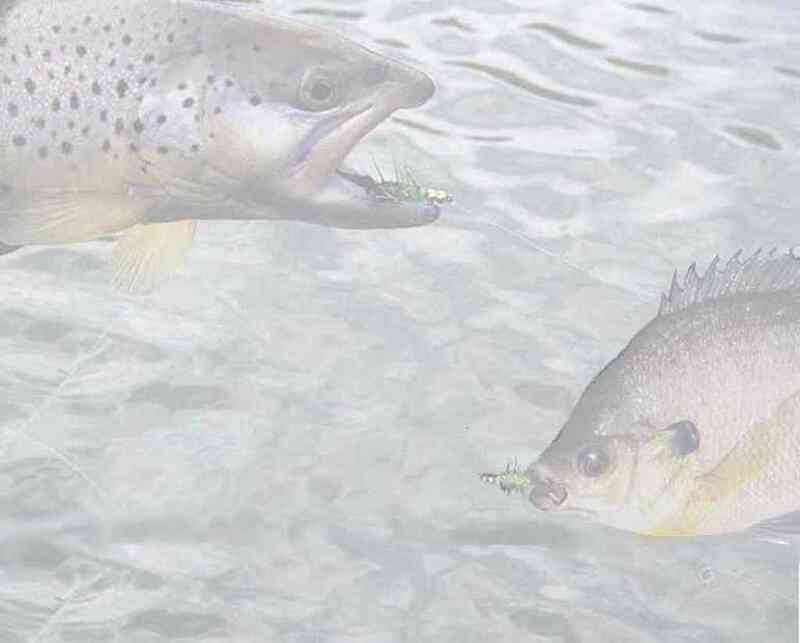 It casts easily without the twisting of lipped flies but dives enticingly on the strip. The rear tab of foam and the air space below it captures air which bubbles on the dive. The turbulence it creates, along with the dynamics of the wing, cause the fly to wiggle side-to-side. And because it sits a little lower in the water than the traditional bass popper, the hook-up ratio is quite good. 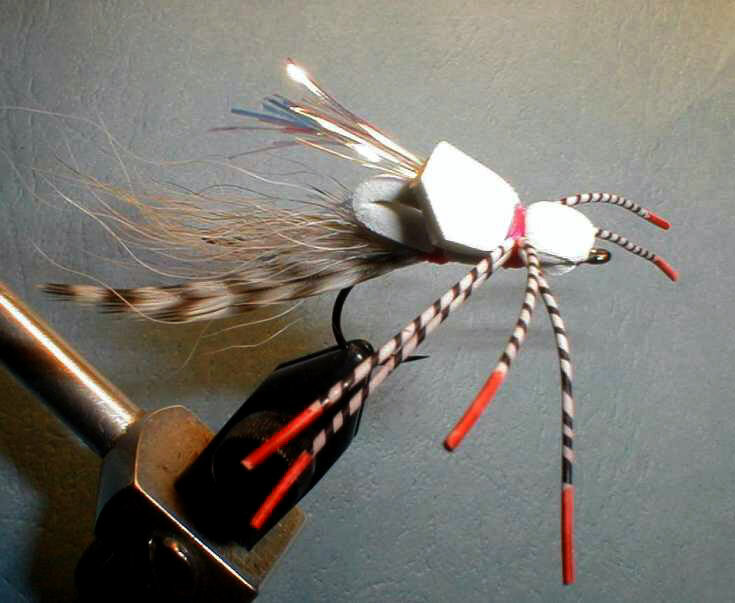 I tie some in bright color combinations and add of flash wings and rubber legs. The "stealth" name hardly applies to its appearance, but its action can still be quite stealthy. With soft little strips it will wiggle and maybe "bloop" slightly. Strip with a just a little bit more vigor and it will dive and bubble, but still stay in the target zone (the strip here should be very quick, but very short). Give it a longer, harder strip and it will dive hard and create a major commotion. Jack Dennis fished it all day at Callaway recently while filming an episode of "FlyFish TV" and said, "I've caught so many fish on it, I can't bear to take it off ". A pattern template for this basic version of the stealth bomber is available here. Custom foam cutters for the deluxe/improved pattern is available from River Road Creations. Cut 2mm craft foam as shown. After tying, the corners at the left will be clipped to further the "stealth" shape (and to make it more aerodynamic in casting). 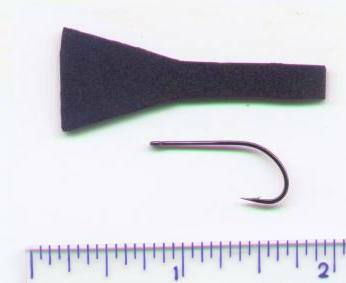 The photo shows a #6 Gamakatsu B10S stinger hook and the appropriate sized foam, but it works for other hooks too. The photo shows the approximate position in which the foam will be tied to the hook, i.e. with the base of the triangle just a bit behind the hook eye. 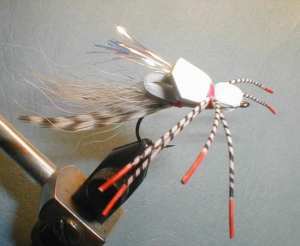 Tie in a tail - shown here is black over white bucktail with a little "Bite-Me Flash" in between, but others can be substituted. Tie in the foam at the rear, add a drop of Super Glue. Check to be sure foam is centered and in alignment with the hook. Then advance the thread to mid-shank. The thread may be dubbed (shown here with Bite-Me dubbed lightly). Tie down the foam at mid-shank & add drop of Super Glue. Advance thread to hook eye, dubbing if desired. Tie down foam at eye. If the foam is correctly positioned, the tie down point will be just into the widened part of the foam at the base of triangle. 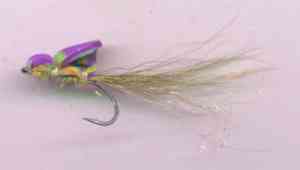 It is not necessary to leave room at the eye for tying off the fly, as that is done at the mid-point of the shank. So run the foam right up to the eye. Return the thread to the mid-shank tie down point with a soft wrap over the top of the forward section. This will be covered and protected when the fly is completed. Fold the foam tab from the rear forward and tie it down at the mid-shank position. Catch just the tip of the foam with your tread. You can leave varying amounts of air space under the forward-folded tab to increase floatation and the bubble trail it leaves when stripped. Trim off any excess tab in front of the tie-down point. Now fold the forward triangle back over the fly and tie it down at the mid-shank position. Make sure it is centered over the hook and projects evenly over both sides. Trim the corners off the triangle with scissors. The fly can be tied in the color of your choice. I've done well with white and chartreuse, but don't have a name for those. "Stealth" hardly fits. 8/05 - Here's the current version I'm fishing for largemouth, shoal bass & bream. This is the Stealth in what a friend called full pimp. I've added rubber legs, hackle tips to the deer hair tail, and a wing of holographic flashabou. Here's a bigger photo - note this one has quite a bit of space between the rear tab & the body - that increases the amount of floatation and the bubble trail. 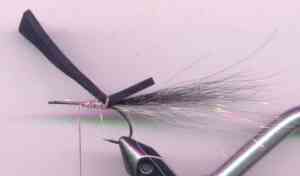 I especially like this on with a dropper off the hook bend. You can twitch it, pop it, or (if the dropper has some weight) strip it hard and dive it pretty deep.